This is a cracking old style pub with flagstone floors etc. The lovely beer garden out back has a real countryside feel to it. There's not much else in Freshwater Bay, so, if you find yourself in the area, I strongly recommend a visit to The Red Lion. I didn't find a better pub on the Island. Lovely setting next to the church. Mainly set up for food, but with a drinkers area around the bar. The Butcombe was fine and the food was very good. Well worth a visit. Visited here on Monday during a Day visit to the I.O.W. Walked from Yarmouth to Freshwater along a designated walk and ended up here. What a find!!! Had an excellent pint (very welcomed) of Goddards Fuddle-De-Dum 4.8%. also available was Sharps Doombar, and Good Old Boy and Mr Chubbs Bitter both form the West Berkshire Brewery. This is a nice pub adjacent to a church sited on a quiet road. some tables outside in the Front and a large beer garden at the rear. From the stickers in the window this place seems to be a regular in The Good Beer Guides and the Egon Ronay Food Guides. Staff were very welcoming and although I did not eat I am sure the food is good. The interior of the pub is traditional warm and inviting, although most tables were given over to food. Nevertheless this pub is high up on my places to revisit ASAP. 10/10 for the Beer. 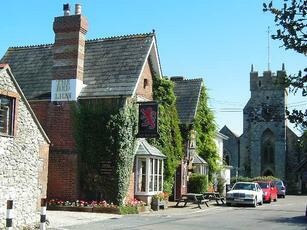 Really great pub set in a pretty village. Good food and beer. Excellent garden but kids not encouraged (probably why it is so nice). Popular with walkers and cyclists. Well worth a visit. Love this pub, have to visit every time I come to the island, and usually save it until our final night. The fish and chips are to die for! I come every year and I am never disappointed. Deserves to win an award!